In essence the emitter location, orientation etc. will be the same every time as in the case of a matinee toggled effect. By specifying Actors for an effect to collide with we can reduce GameThread overhead consumed by calculations related to particle collision. 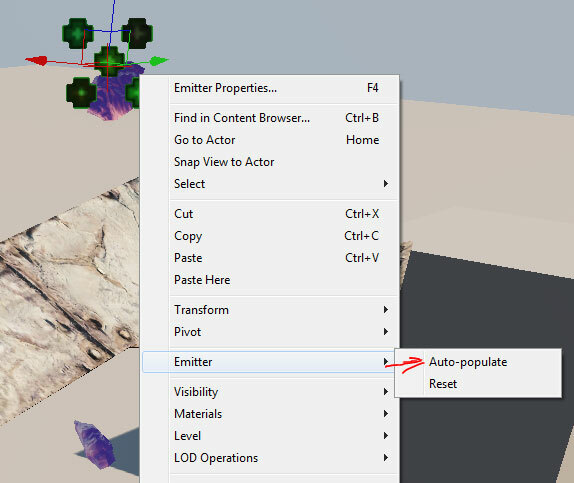 Any emitters with the Collision Actor Module on them in the particle system, will only collide with the actors specified in the Emitter Actor; subsequently flying or falling through everything else. It can be helpful to understand Particle Parameters prior to setting up per actor collisions. Please refer to the Collision Module for more information on setting collision behavior. For this example we will use a particle system with collision already setup, and have the system collide with all objects in the scene by default. 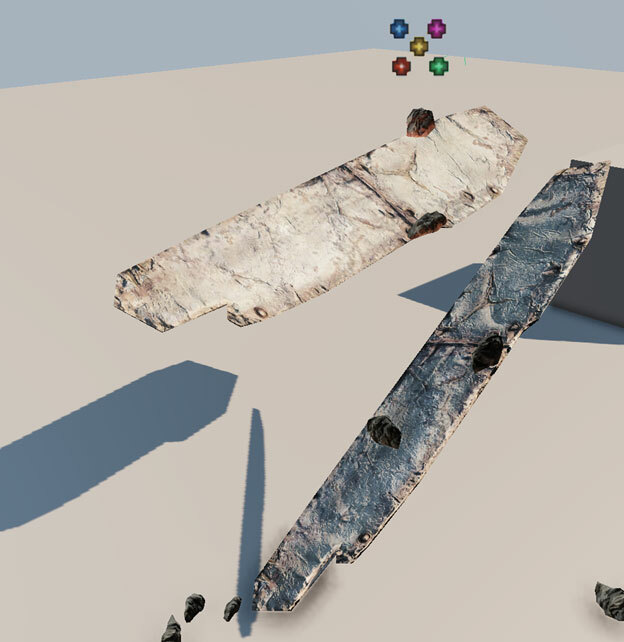 Currently the particles collide with both static meshes and the bsp ground plane using a regular Collision module. By using per Actor collisions we can specify which objects the particle systems (in this case a mesh emitter) will collide with, instead of calculating the entire scene as is the case with the regular Collision module. If you already have a Collision module in your emitter, disable it and retain the settings for later. Right click and add a new Collision Actor module to your emitter using Collision > Collision Actor. 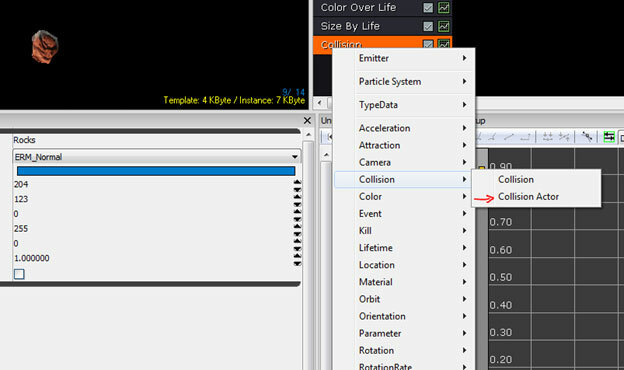 Select the Collision Actor Module and create unique actor parameter names (this is the instance name referenced in the effect placed in the scene) by pressing the Add a New Item button ( ). Note: you will need a parameter name for each actor you wish to collide with, in this case 2. To set up the instance parameters for the effect, select your Emitter Actor in the scene and right click and choose Emitter > Auto Populate. Note: the Instance Parameters of your Emitter Actor will now be bold with 2 new entries  and  with the Instance Parameter names specified in your effect referenced. Point the Instance Parameter to your actors placed in the scene. Click the Lock Selected Actors button ( ) in the upper right corner to retain focus on your Emitter Actor, select the first actor you wish to collide with (Collider1) and reference the actor using the Use Selected Object button ( ). 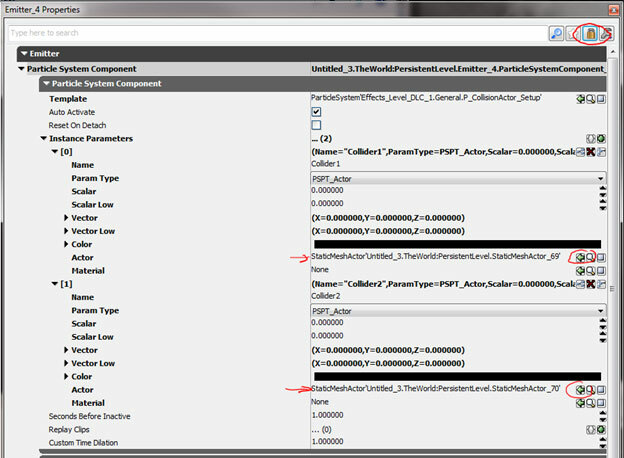 Select your second Actor (Collider 2) and reference using the Use Selected Object button ( ) again. Your particles will now collide with only the actors specified in your scene, falling through any actors not specified. If your particles disappear on collision check your Collision Actor settings and make certain the Collision Completion Option is not set to Kill. From this point setup the collision options to define the collision behavior.